To automatically quiet a receiver by reducing its gain in response to a specified characteristic of the input. 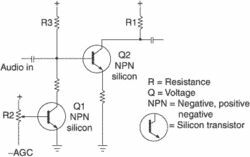 A circuit in a radio receiver that keeps the volume down when no signal is being received, but the volume builds up as soon as a signal is received. The function of a squelch is to adjust the sensitivity of the receiver by eliminating unwanted weak signals that cause background noise such as static, hash, or hiss. Most squelch controls are automatic, but there are a few manual squelch controls, too. Squelch circuits are used in communications equipment, which have long periods of silence between transmissions. The SAS-440 and six-seat SAS-640 are four- and six-place models that have a one-touch button to set the squelch threshold for a given environment, pilot isolation and multiple mounting schemes. The SCI-series intercoms offer dual volume and squelch control and are a drop-in upgrade to an existing SPA400 or SPA600. PM3000 $493 4-6 Single volume and squelch control, stereo with karaoke mode. Executives can greatly reduce the impact of corporate rumors by creating a two-way dialogue with visitors to their corporate websites and providing them with senior management contact information in an effort to squelch the false rumor or at least neutralize unfounded criticism," added Ms. The Commission should not allow cynical accusations of improper meetings to squelch these types of legitimate discussions. A group of hillside landowners has declared war on the Santa Monica Mountains Conservancy, which they claim is trying to squelch development by refusing to grant them access to their property through the new Michael D.
Janssen's play is a fable about a king who brings in otherworldly help to squelch his passionate daughters' plans. OTCBB:NCTI) today announced two new proprietary algorithms in its ClearSpeech(R) suite of voice-enhancing software, ClearSpeech Speech in Noise Detector (SND), and ClearSpeech Intelligent Squelch Filter (ISF). Both the S7035 and S7026 TIAs feature individual Loss of Signal (LOS) detection circuitry with Squelch, which prevents a false lock on the clock and data recovery unit, providing customers with more performance reliability. Power saving features include voice-operated transmission (VOX), which disables the transmitter's output buffers; a pop-free squelch circuit, which mutes the receiver chip's audio amplifiers; and standby operation for each chip's second channel, providing mono operation. From a functional standpoint, each of the two high-sensitivity receivers in the TSH511 includes an RF front-end low-noise amplifier, an intermediate amplifier that connects to two external filters, voltage limiter, quadrature FM demodulator, and audio buffer with squelch circuit.